I can't wait for the new butter LONDONs to hit the stores, but here is an updated preview! Fiddlesticks - A full coverage, semi-matte, magenta glitter suspended in a raspberry base. Scuppered - An opaque, copper shimmer infused with pink, gold and green glitter. Jack the Lad - An opaque, moss green shimmer with gold, turquoise and green micro glitter. Fairy Cake - A full coverage, silvery lacquer with multi-coloured iridescent glitter in a light grey base. Scallywag - A full coverage, bright turquoise glitter with a clear base. Sparkle, Sparkle! This holiday season, butter LONDON is all about making a glittering statement. We drew inspiration from the jeweled collars, sequins and metallic embellishments seen at Fashion Week. Our holiday colours are unique and edgy, while still completely wearable and elegant. 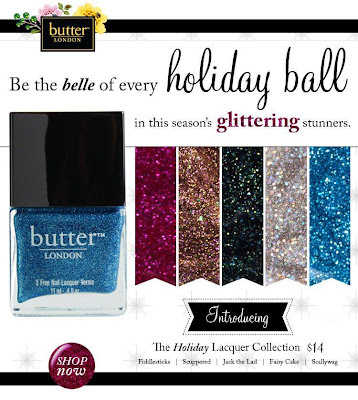 This collection covers the glitter gamut with colours perfect for every holiday event, whether the party calls for a sophisticated glitter or one that sparkles like a disco ball! The new butter LONDON shades are currently available on butterLONDON.com for $14 per bottle. They will also be available at retail stores, such as Nordstrom and Ulta.